Built between the walls and the sea in the early 1st cent. AD, this bath complex is one of the best preserved in ancient times. The half-columned portal with tympanum leads into the vestibule with impluvium, bordered by 4 columns; water sprays into the circular fountain from the herm (portrait on the pilaster). The vestibule opens to the right, through a corridor, onto a waiting room with a floor in signinum opus, and to the praefurnium (oven for heating). The bathing rooms as such include the frigidarium (cold bathing room), with a floor of white marble slabs and frescoes in fourth style, the tepidarium, with a floor of slate slabs and stuccoes on the walls depicting warriors, the caldarium (hot bathing room), with walls decorated in fourth style. In this room one can see the impression of the labrum (tub for ablutions) in the volcanic material that came in through the window, which violently tore the basin from its support. 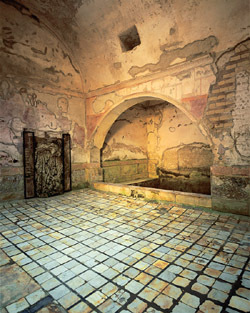 Finally, the eastern sector of the bath complex includes an apsidal room, with a ‘pool’ heated using the ‘samovar’ system (a receptacle placed in the center of the room, below which the fire was lit directly), and the laconicum (steam bath room), with a black mosaic floor on a white background.